"This is my Son, the Beloved; my favour rests on him." We thank God for the gift of Baptism. 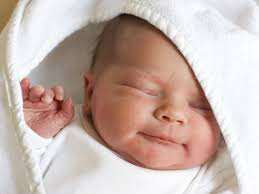 One might think, why should I thank God for something I was made have as a baby, I had no choice in the matter? Others may have to wait until they are adults to receive the Sacrament. It is the very fact that we were given this holy gift that we should be thanking God . Baptism is a Sacrament. It is the first Sacrament and it brings us into communion with God in heaven. By our Baptism, we become adopted sons and daughters of God the Father in Heaven, through the Sacrifice of His Son, Jesus Christ on the Cross. Because of our Baptism, Heaven is now in our grasp as we have one who has died to take away all sin, but the choice for God must be ours. We can choose to accept our Baptism and to embrace it with a heart of understanding, love and gratitude to God. When we understand the gift given to us by God, we can then embrace it and use it for its given purpose to communicate with God and to attain eternal salvation. 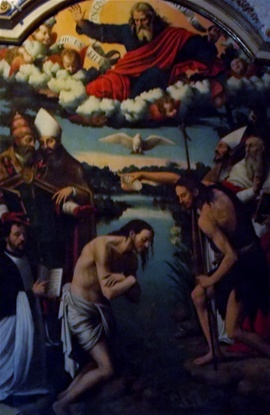 In today's Gospel on the Baptism of our Lord, Jesus Christ, John questions Jesus about having to Baptise him, surely it should be Jesus who baptises John? Jesus in wisdom tells John to leave things as they are for the moment, cf.(Jn. 3: 13-17). John the Baptist a man who had an encounter with Jesus in the womb before his birth, a holy man, questioned God but Jesus put his mind at rest and he continued to do what God willed. Man cannot and does not know the mind of God, he can only trust that God knows best and let God be God in all things. When God gives us a wonderful gift, we should grasp it with open arms and gratefully accept it. On this feast of the Baptism of Our Lord, Jesus Christ let us give thanks to God for the wonderful gift of Baptism. Let us use this gift in coming to know God in a real and living way. May we be a people who walk in the Light of Christ to God the Father with the Holy Spirit. Amen. We thank God for the Holy Family and for the gift of family life. Today as we celebrate the Feast of the Holy Family we thank God for the gift of Mary, Jesus and Joseph, the Holy Family, the one we model our families on. We also thank God for our own unique families of origin. Families are not perfect but where there is love, compassion, patience and understanding they are places that warm our hearts and heal our hurts. God did not abandon us in this life he gave us parents, grandparents, cousins and relations to share our life with. 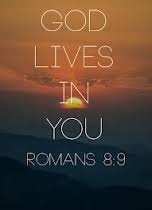 He gave us a place to grow and live amongst others. A place where we could meet Him in the company of those around us. He gave us a place where we could also experience conflict and learn how to manage it and grow from it. 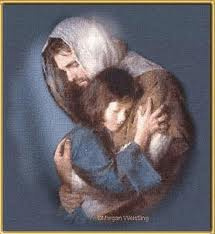 He gave us loving arms to hold us as children, to guide us and protect us until we became adults ourselves. On this great Feast of the Holy Family we thank God for all family life, the joys, sorrows, conflicts and happy times. We ask God to bless all families and to help them to model their family lives on that of the Holy Family. We pray for families who are suffering the pain of loss on the death of a loved one or for families who have suffered breakups, may God help them in their struggles and comfort them in their pain. Today let us bring glory and thanks to God by living His message in our families and being a place filled with His, love, His gentleness, His compassion and His understanding. We thank God for the gift of His son Jesus Christ, the Saviour of the world. God so loved the world that he sent his only son into the world to live among us. Jesus Christ became man, he took on our humanity so we could take on His Divinity. What greater love is there than to lay down your life for another. Jesus, this new infant baby came to do just that for love of God's people. Sin created a great divide between God and man. This divide could only be removed by a perfect sacrifice. Jesus, the Son of God was the only one who could make such a perfect offering to God on our behalf. God saw what he had made and found it very good. We are created by God and loved beyond all telling by God. This Christmas time let us have hearts filled with gratitude to God for all his wonderous love. Let us show Him our gratitude by following the example this little infant child has come to show us and by listening to his teachings as laid down for us in Sacred Scripture. Today we thank God for the gift of our Blessed Lady, Mary, mother of our Lord and Saviour, Jesus Christ. Mary is God's gift to the Church and to all mankind. She was chosen by God to be the mother of His Son, Jesus Christ. Mary had to be free from all sin in order to give birth to the Son of God. God the Father, made her perfect, free from sin and full of Grace. Mary was full of faith and when asked to be the mother of God the son she said yes. Her life was one of much joy and much suffering but all was lived and offered to God. Mary is the perfect example of how to live free from sin. She is our spiritual mother and never fails to intercede with her Son on our behalf. She protects us from evil and guides us on our journey through this life. God has given us the perfect woman/mother to love us and to help us and so we thank Him for this beautiful gentle mother. When we honour our Blessed Lady, we give glory to God. 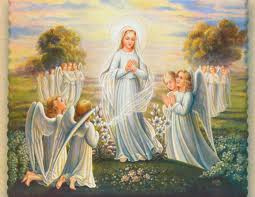 Let us show our gratitude to God by allowing our Lady to guide us and lead us on our journey through lift to heaven. We thank God for the gift of Priests. Jesus Christ, is the one true High Priest who spoke God's message, healed,forgave and gave us the perfect example of love. He also appointed Apostles to go out and to preach God's message. He named Peter as the rock, the one who would build His church. St. Peter was the first pope and the Apostles were the first priests appointed by Him. All down through the generations we have been blessed to have Priests to serve the people. Without a priest there would be no mass and no sacraments hence no communication with God and certainly no grace to assist us on our journey. Priests are the hands and feet of Christ their role is to serve Him and to bring souls to Him. Down through the ages there have been some bad things happening in the Church and priests have sometimes been at the centre of these things. We must pray for them and remember that we are all fragile and tainted with a fallen nature and all judgement belongs to God alone. It is wonderful to see a priest filled with God's Holy Spirit who passes on God's message through His word. We thank God for such priests. We thank God for leaving us with shepherds to guide us on our journey to Heaven. This Advent let us bring glory to God by praying for His priests, by being kind to them and helpful in any way we can. "You see before me the Lord's servant, let it happen to me as you have said"
As we wait in joyful hope for the coming of our Saviour, Jesus Christ we thank God for the gift of Advent. Advent is a time for standing still, a time for waiting patiently with our Blessed Lady, Mary. During the time of Advent God gives us a time of calm, peace and serenity. A time to prepare for the coming of Jesus Christ, God made man, who comes from heaven to earth to redeem mankind. Advent is a sort of a John the Baptist moment, "prepare the way of the Lord". We prepare for the birth of Jesus. We wait with Mary in patient prayer to God the Father. It is a time to believe in God's promise of love and salvation and a time to be joyful. During the season of Advent God the father prepares us for the meeting with the newborn baby Jesus, His only son on Christmas day. Our hearts, minds and souls are calmed and prepared. Our spirits are refreshed and our hearts and minds made new. We thank God for this wonderful time of Advent, for the gift of His wisdom and we pray that we will bring honour and glory to Him by being a people of prayer, love and calm waiting. In this month of November, we pray for our dead. 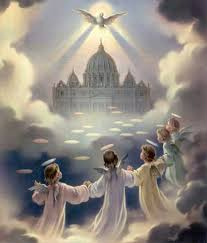 We remember the holy souls in Purgatory. It the custom to do so and has been done down through the generations. We should take time to think about our own soul while we are alive here on this earth. We know how to look after our bodies, we feed, wash, cloth and protect them. We also look after our minds. We rest when we need to, we educate our brains to keep them active. We seek medical help when we need it. But what about our souls? The soul is the part of the body that gives eternal life. It is in our soul that we meet God. Our soul is affected and bombarded by all kinds of noise and intrusions. It is the centre of our being, the place where we meet our Creator, the inner Sanctuary and yet it is probably the most neglected part of us. When the soul is neglected so too is our relationship with God our Creator. Without this precious gift of contact with God we wilt and die. Let us take the necessary time to pray for the souls of those gone before us marked with the sign of faith and also the time to guard and protect our own souls from anything that will harm them and separate us from our Creator. In this way we will be able to thank God and to bring Him glory by recognising Him who is our King, present and living within the tabernacle of our souls. Today we thank God for the gift of His mercy. Often times we have heard the prayer "God be merciful to me a sinner" read at Mass. How often do we pray, God help me to show mercy to others and not to judge them. If I expect God to be merciful to me then I too must show mercy to my fellow man. It is so easy to fall into the trap of asking God for mercy and then showing none to those who are in need of it. 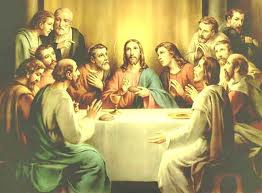 Jesus told another parable to some persons fuly convinced of their own righteousness, who looked down on others. "Two men went up to the Temple to pray: one as a Pharisee and the other a tax collector. The Pharisee stood by himself and said "I thank you, God that I am not like other people, grasping, crooked, adulterous or even like this tax collector. I fast twice a week and give the tenth of all my income to the Temple." In the meantime the tax collector, standing far off, would not even lift his eyes to heaven, but beat his breast saying: "O God, be merciful to me a sinner." God has no limits to his gift of mercy. It is ours for the asking. He revealed to St. Faustina His desire for His mercy to be made known to all. We pray a prayer of thanksgiving to God for this wonderful gift of his mercy and ask his help in following his example in having merciful hearts. God said, "be masters of the fish of the sea, the birds of heaven and all the living creatures that move on earth." Today we thank God for the gift of creatures. Creatures are God's wonderful gift to mankind. There are many different kinds, some wild, others tame but each have a purpose here on earth. This year I had the opportunity to visit a water park in Valentia, Spain. I never thought that I could feel the awe of a child now that I was getting on in years but I did. I saw God's creative hand in his sea creatures up close and it was amazing. All sorts, small fish, big fish and mammels. When I gazed at them as they gracefully swam above me I was filled with wonder and awe for God. No human being could create creatures such as these. On a closer to home reminder of God in creation, my daughter's beautiful cat Garry reminds me of the wisdom of God in creating pets. So many people rely on and need a pet around the place. As I check my twitter account, I see many pictures of dogs and cats posted by their owners. God gave us these beautiful creatures to keep us company on our journey of life and to give us joy as pets do. Sometimes sad to say pets give more love than humans do. They can even protect or guide their owners. How loving, kind and wise God is. We thank Him. 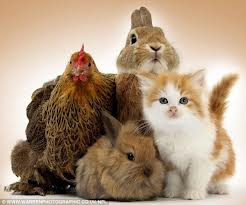 Let us always remember that God created creatures and that we must show respect, love and care for them at all times. St. Francis of Assisi was a great lover of animals and had a wonderful way with them. May we bring glory to God in our behaviour towards His creatures. Now you are no longer strangers or guests, but fellow citizens of the holy people: you are of the household of God. Today we thank God for the gift of holiness. Holiness is not something we thing about much. Did you know that we are all called to be saints. For me to become a saint means I must love God with the purest heart I can humanly have. It is what each of us are called to be. In today's reading Eph. 2:22 "In him you too are being buit to become the spiritual sanctuary of God." God does not and cannot reside in a sanctuary that is tainted by sin. God offers us the gift of holiness. Through His grace, the use of the Sacraments, frequent mass and Holy Communion we have the means to grow in holiness and eventually become the spiritual sanctuary where God can reside. We pray for the desire to become holy and for the graces needed to attain a life of holiness. May our striving to live pure lives bring a holy joy to God our Father in heaven and may we seek to do only his will in our daily living.